Rudon Hydraulics is an industrial supply store in Terrace, British Columbia, specializing in hydraulics, hoses and fittings. We also have a wide range of general industrial supplies so your business can get exactly what it needs. 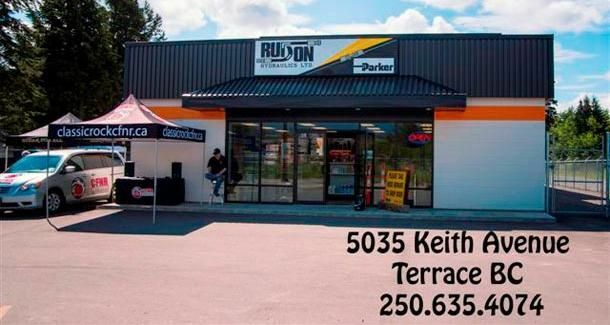 You have the choice to either pick up the parts you need at our convenient location at 5035 Keith Avenue or at our distribution locations in Prince Rupert, Kitimat, Stewart and Iskut. Many of our clients are actually managers and owners of an industrial business, so we understand that you need to keep your budget in check. Customers can easily keep a tab with us by setting up an account through a simple credit check and references. In these situations, the customer would pay us monthly instead of during each trip – this is particularly convenient for our commercial and industrial clients who break their finances into monthly budgets. Visit our shop today to learn more about your financing options. We are affiliated with the Chamber of Commerce.